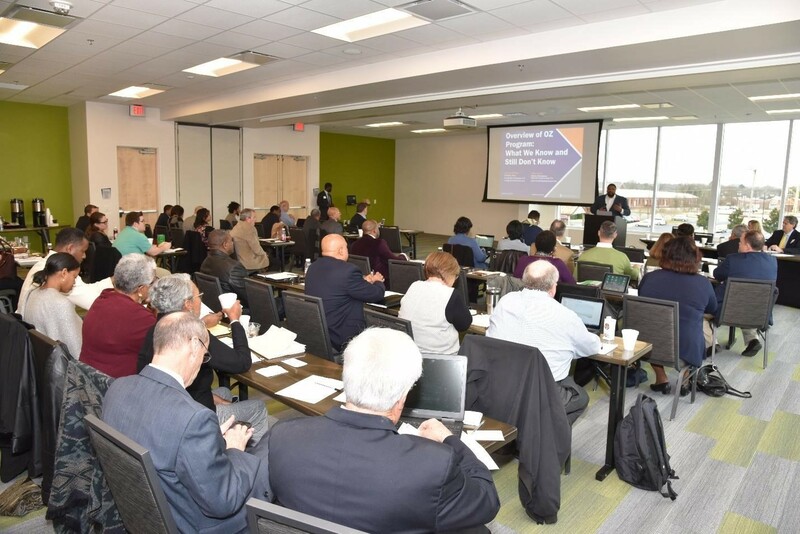 Rocky Mount, N.C. – Approximately 60 investors, local and regional town administrators, economic developers and city officials recently met at the Rocky Mount Event Center for the North Carolina Opportunity Zones Convening of Local Stakeholders. The gathering, led by BWC Consulting, was designed to introduce participants to opportunity zones, how they have served areas in the past, and the potential they might have in Rocky Mount. North Carolina’s Opportunity Zones Program provides tax incentives for qualified investors to re-invest unrealized capital gains into low-income communities. Rocky Mount City Manager Rochelle Small-Toney said the area is on a journey that started decades ago downtown with the development and redevelopment of the Douglas Block as well as Harambee Square. Small-Toney said with the opening of the Rocky Mount Event Center in 2018, the city is focused on the next phase of downtown development growth. The program will be deliberate in its approach. Questions and issues pertaining to the Opportunity Zones will be submitted to local communities with the goal being an enhanced insight regarding solutions and highlighting opportunities. Rocky Mount’s Department of Community and Business Development. For additional information and topics for upcoming forums, call 252-972-1100.